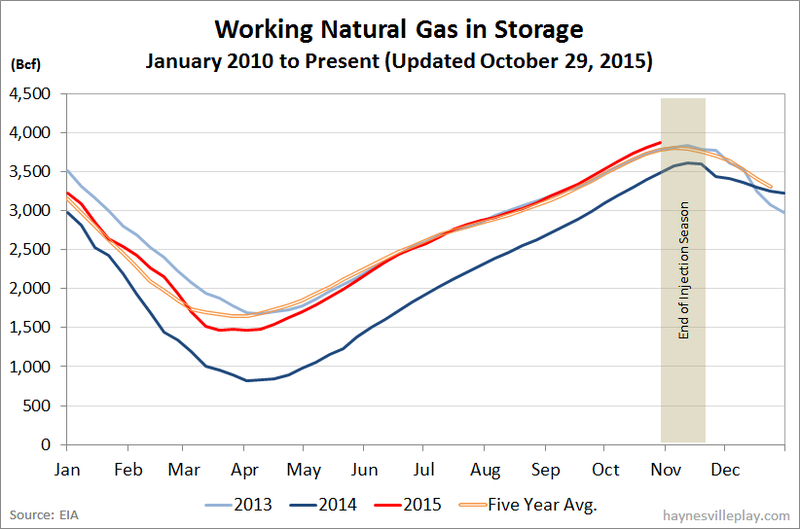 As we close in on the end of the injection season, the EIA reported yesterday that working gas in storage was up 63 Bcf to 3.877 Tcf. The net injection was actually 28% lower than last year (+88 Bcf) and 14% below the five year average (+73 Bcf). 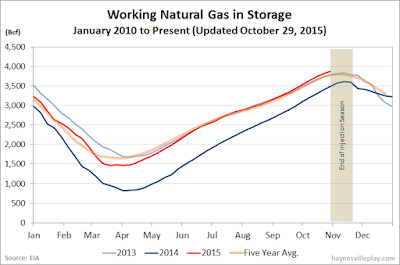 The current storage level is now 11.8% above last year (3.468, a difference of 409 Bcf) and 4.1% higher than the five year average (3.724 Tcf, a difference of 153 Bcf). "Temperatures in the Lower 48 states averaged 57° for the storage report week, 1° warmer than the 30-year normal temperature and 1° cooler than the average temperature during the same week last year. There were 68 population-weighted heating degree days (HDD) during this report week, 9 HDD more than the five-year average and 8 HDD more than during the same period last year. There were also 10 population-weighted cooling degree days (CDD) this report week, 2 CDD more than the five-year average and 3 CDD more than this week last year."